3 Fire-Sale Stocks: Will They Bounce Back or Burn You? These stocks have plummeted, but not all of them are good deals. Hunting for bargains in the stock market often involves looking at stocks that have fallen considerably in value. Just because a stock is well off its recent high doesn't automatically mean it's a good deal, but a steep decline comes with the kind of pessimism that tends to push a stock down too far. When no one seems to want to touch a stock, that's sometimes (but not always) the best time to buy. FireEye (NASDAQ:FEYE), Denbury Resources (NYSE:DNR), and Gilead Sciences (NASDAQ:GILD) are all down quite a bit from their respective highs. Are these fire-sale stocks worth buying? Here's what three of our contributors think. 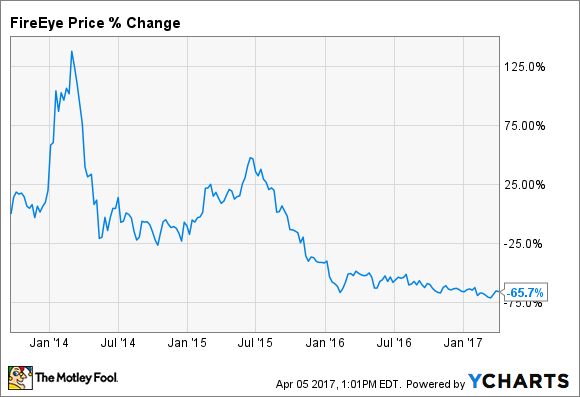 Tim Green (FireEye): Shares of cybersecurity company FireEye have been decimated since the stock peaked in early 2014, soon after its initial public offering; they are now down 87%. Extremely rapid revenue growth was enough to buoy the stock for a while despite massive and unending losses, but as revenue growth slowed, it became clear to investors that the stock was radically overpriced. FireEye announced plans to lay off 300 to 400 of its 3,400 employees late last year, and cost-cutting is now the name of the game. Fourth-quarter revenue was flat year over year, but the company was able to slash operating costs and reduce its losses. Despite major cuts in R&D spending, FireEye expects its latest line of products to eventually return the company to growth. Not in the first quarter, though. Revenue is expected to slump by as much as 4.8%, and billings are expected to be well below revenue. Is FireEye stock a buy now that it's been beaten down so much? The problem with investing in a company like FireEye is that predicting future profits is next to impossible. The company has never been profitable, even when times were good. Now that growth has ground to a halt, I see little reason to expect meaningful profits anytime soon. FireEye stock is still valued at around 3 times sales, a price that comes with too much risk for my tastes. A different oil producer worth a look? Tyler Crowe (Denbury Resources): Oil and gas drilling activity has been on the rise for a while, but not all companies have been feeling the benefits of it. Denbury Resources' stock, for example, is down 32% since the beginning of the year, and it currently trades at 0.97 times sales, which is still well below its historical averages. One of the reasons Wall Street has shed away from Denbury is that it is a different type of oil and gas producer. Unlike most independent companies looking to drill shale wells today, Denbury focuses on a different extraction method. It injects CO2 into older, mature wells that still have oil in place, but that oil can no longer be pulled out of the ground using more conventional methods. There are some benefits to this extraction process -- exploration costs are minimal, decline rates are low, and capital requirements are small once it has injected a reservoir -- but one of the drawbacks is that it has historically been a more expensive source. Some investors might also knock the company's production rates since oil prices started to decline. From 2014 to the most recent quarter, total production has fallen 16% after adjusting for asset sales. Most of that decline is a result of the company cutting its capital spending budget -- capital expenditures in 2016 was $250 million compared to $1.1 billion in 2014. Management's plan, here, is to cut costs and lower costs until oil prices recover. The company has done a commendable job of that. On top of that large capital spending cut, it has reduced its total operating expenses to $33.79 per barrel. That's enough at even at today's prices to allow the company to generate some modest profits and bring in enough cash to not take on any new debt. Denbury's unique oil and gas business has allowed it to weather the storm better than some, but it isn't going to see the same rapid rebound that some shale producers have experienced. If oil prices do continue to rise gradually, Denbury will look better by the day, and it might make for an interesting investment at today's deeply depressed stock price. Cory Renauer (Gilead Sciences, Inc.): Looking for companies generating profits and distributing them to shareholders is one of the best ways to avoid getting burned by fire-sale stocks, and this biotech hits both marks in spectacular fashion. Gilead Sciences generated an astounding $15.9 billion in free cash flow last year, more than all but a handful of the world's publicly traded companies, and it returned about $13.5 billion in the form of share repurchases and dividends. Although last year's cash flows were enormous, they weren't nearly as high as the $19.6 billion Gilead Sciences reported a year earlier. The altered trajectory combined with a depressed outlook for 2017 are why the stock is trading at the bargain-bin price of just 5.7 times trailing free cash flow. Management stunned the markets recently with expectations that hepatitis treatments will continue falling from $14.8 billion last year to between $7.5 billion and $9.0 billion this year. Luckily, non-hepatitis sales are expected to rise, especially the company's HIV franchise. Gilead's next-generation HIV antivirals based on tenofovir alafenamide are more effective and far more tolerable than previous offerings, which are some important features for drugs that requires lifelong dosing. It seems all of the bad news is out in the open, and already baked into the stock's ultra-low price. Gilead Sciences stock might not rebound to previous highs in the near term, but investors will be treated to a generous dividend that offers a 3.1% yield at recent prices. Combined with heavy share repurchases, the long wait for a rebound might even be a pleasant one.